Fort Worden State Park is one of Washington’s treasures. Situated on the northeast tip of the Olympic Peninsula, it offers stunning views, soft sandy beaches, and wooded hiking and biking trails. It’s also just minutes from historic downtown Port Townsend, one of the most picturesque towns in the state. The view from Fort Worden. Few beaches in the Puget Sound area can match the beach at Fort Worden. Grassy dunes line the sand, dancing in the ever-present breeze. Mount Baker, the Cascade Range, and Mount Rainier stand tall in the distance, while the cliffs of Whidbey Island shimmer in the foreground. The deep sand begs for bare feet, the drift wood inspires fort building, and the water is cooling on a hot day. At low tide, it’s possible to walk all the way from Point Hudson Marina in town to the Point Wilson Lighthouse at the tip of the park. Once around the point, walkers are rewarded with big views of the Strait of Juan de Fuca, which joins the Sound here. A small but interesting Marine Science Center sits proudly out on the pier, and a small store by the beach provides refreshments for beach-goers. In addition to the beach, Fort Worden has many wonderful walking trails throughout it’s 434-acres. Explore the old military bunkers, walk along the top of cliffs, and head out to North Beach, where grasslands meet the woods and rocky shores. It’s always a good idea to bring snacks, for the trails meander and it’s easy to spend hours exploring them. Bikers will want to stick to old access roads, which are closed to most vehicles. Folks who can’t make the walk to the bunkers are permitted to drive to them. Camp sites are available on the beach and in the woods. The historic houses along Officer’s Row are available for rent, as are smaller homes elsewhere in the park. Additional information is available at Fort Worden. A glass of Washington State Wine or Hard Cider from the Olympic Peninsula is the perfect way to close a day at Fort Worden. 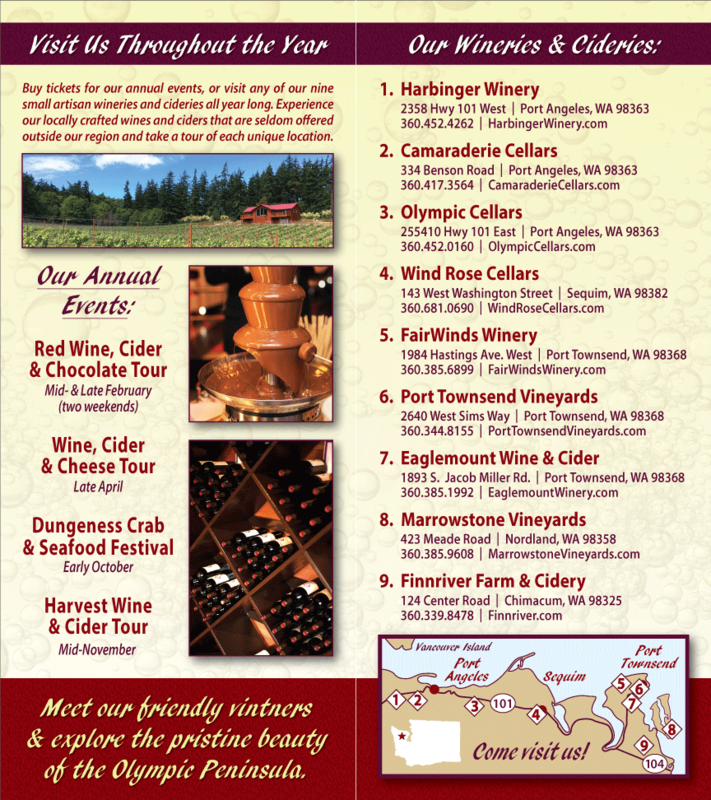 Swing by one of our member Washington State Wineries to taste their wine and hard cider. Sorensen Cellars and FairWinds Winery are located in Port Townsend. Eaglemount Wine and Cider is located off Route 20 by Discovery Bay, and Finnriver Farm and Cidery is located in Chimacum, south of Port Townsend.